This Museo Mundial installation sheds light on the topic of maternal health and contributes, primarily, to the achievement of Millennium Development Goal (MDG) 5 (“Improve Maternal Health”). The chosen approach recognizes the wide variety of factors that can contribute to preventing women and girls from accessing the maternal health care they need and points out that by saving a mother’s life the whole community benefits. The main point of this installation is to make absolutely clear that we should all be aware of one of the major dramas for women in so-called developing countries: maternal mortality. We live in an age in which we expect to give birth safely. In this installation, some of the conditions that transform this unique moment into one of the most dangerous moments in a woman's life are presented. To raise awareness on MDG 5, the idea was to link the local and global level of this topic by creating a strong visual impact by building the installation around household furniture, specifically furniture from the bedroom/baby room, that is kept in a museum storage room. The installation displays the domestic environment of rural communities around Loures over the last 100 years. These rural mothers usually gave birth at home, in their bedroom. In this storage room open to the public, typical furniture from rural communities around Loures in the 20th century can be viewed. The layout of the room was changed slightly to give it a new meaning: the moment of childbirth, since, traditionally, local mothers usually gave birth at home with little or no medical assistance. On some of the furniture (mostly mirrors and doors), pictures showing the silhouettes of pregnant women were hung, as well as various posters displaying global facts and figures on this topic (such as the maternal mortality rate). It has a strong visual impact. To make this setting even more dramatic, a mosquito net was placed over the bed, thereby linking the installation to so-called developing countries, and at the end of the bed a traditional “nest” (composed by bed, washbasin, chairs) was staged, explaining how local women used to give birth, which enhances the links between both realities. Two chairs were placed side-by-side with a small space between them. A washbasin was placed between them on the ground. The woman would perch between the two chairs, assisted by an elder woman who was rarely a trained nurse or doctor. Although the bed was not used for delivering the child, a mosquito net was added to it to help visitors realize how such a small and simple item can make a huge difference in so-called developing countries where lethal diseases are spread by particular insects. Finally, one of the dressing tables holds [a magnet quiz where visitors are invited to build a diamond, by ranking the different causes of maternal mortality]. To complete the scene, photos have been added, showing the body positions in which local pregnant women gave birth traditionally, as well as an historical study with lots of explanations about pregnant women, giving birth, and healthcare for newborn babies and new mothers. Before taking any action, it is important to analyse the pre-existing conditions at any sites identified during previous visits and/or discussions. The choice must meet the criteria of combining both local and MDG aspects in a way that makes it easy for the visitor to identify them and to establish the intended linkages. With this premise in mind, and taking into account the MDG to be covered (MDG 5), the local museum’s storage room for 19th and 20th century furniture was an obvious choice. Once you have identified the precise location, you need to consider the type of installation to set up and then plan ahead. In our case, we needed to address the issue of reducing the maternal mortality rate and to establish connections between the local dimension of Loures and the overall issue of maternal mortality in so-called developing countries. We then had the idea of arranging a scene with a strong visual impact (silhouettes on the mirrors and the mosquito net), mixing different elements in the room to cover the local and global dimensions of a bedroom, and linking a 1930s bed (part of the museum’s local collection) to facts and figures on childbirth in so-called developing countries. The ambiance was set when photos and a traditional nest to give birth were added. Note: It is important to draw attention to the problem and to avoid reinforcing stereotypes or transforming this installation into a theatre stage. covered by other MDGs, the team needed to come up with answers and suitable solutions to many of these questions. Note: it is very important to test the message that you want to convey. Sometimes a message that is clear in our minds becomes less clear once it is applied in practice. Successful implementation depends on a tight schedule, in which tasks are grouped together. While preparing the schedule, it is also necessary to think about and adjust elements that were not previously planned or considered. Note: please do not forget to schedule inauguration dates for the different installations, bearing in mind the fact that tying the inauguration to a special day can increase publicity around the installation. In our case we chose Mother’s Day (in Portugal). What materials are most suitable for conveying our message through the installation? When we talk about maternal health, we are talking about prenatal and postnatal healthcare, conditions in hospitals, women’s education, and a whole series of other factors that impact on childbirth. So, the installation focuses on women in labour, comparing local conditions for childbirth (in the recent past) with global conditions for childbirth (at the present time). An educational challenge/activity invites visitors to reflect on the multitude of factors linked to maternal health in all countries. Mosquito net: a simple mosquito net, placed above the bedroom’s king size bed to create a strong visual impact. Everyone can easily understand that something is out of context and that it is not meant to be displayed in this striking way inside the furniture storage room. The poster/infographic, pregnant women silhouettes and sheet/leaflet include the following aspects: the type of information to be covered; background; facts and figures; additional information; a call to action; the link between the local museum and the MDGs; and photos. Magnetic diamond game and supporting structure: This game is quite personal and there is no “right” or “wrong” answer. The rationale is to engage visitors, and to provoke discussion and further reflection. Visitors are asked to take a photo of their diamond which is filled with values and share it via the project’s official Facebook page. After identifying the type of installation to develop, and the place to implement it, it is necessary to dedicate some time to compose carefully the message to be transmitted. The message had two possible aspects to it: we could either focus on the negative side and talk about death, or we could focus on the more positive side. So, we chose to look on the bright side by focusing on the number of lives that can be saved through a set of improvements in prenatal and postnatal care for women. The collected data should be as accurate and up-to-date as possible. To achieve this goal more easily, ensure your topic is based on recognised sources with high levels of credibility, expertise and research. When you are addressing a topic like the MDGs, it is almost compulsory to consult the United Nations (UN) website. We have also relied on information from international organizations recognised for their work in the field of maternal health. materials, including the website and the web platform. One of the team members (full time) wrote the draft contents, which was later shared, improved and approved by the rest of the team (four members/part-time). Make sure you do this in a way that reinforces your partnerships and builds team spirit. Finally, use plain and simple language accessible to everyone. Around the room in front of every mirror (six), we placed a silhouette of a pregnant woman, and placed accompanying information about MDG 5 nearby. Above the bed we hung a mosquito net. In this way, we are raising awareness on Malaria, one of the main causes of death among pregnant women in Africa. This leaflet provides data and concrete information on MDG 5. It presents sexual and reproductive health as a human right and the role played by women in the social and economic progress of a nation. It also provides website addresses to encourage visitors to take action and to learn more about the subject. Also important is the connection between the local and the global level - in this case the bed and the way of giving birth in the Loures region. The leaflet is displayed in a special stand. Another part of this installation is a magnet board game called “Diamond Ranking”. Visitors are encouraged to rank each statement on the board. The magnetic pieces have 2 sides. The pink side lists statements on maternal health, while the blank side lists statements on social justice. This allows visitors to rank two types of issues. Visitors must place the most important statement at the top of the formation and the least important statement at the bottom. The second, third and fourth rows contain statements ranked in descending order of importance, with each row containing two, three and two statements respectively. After they finish ranking the statements, visitors are invited to take a photo and to share it on social networks. In this way, we can easily measure the level of visitors’ engagement with this particular installation. Unfortunately, as no wifi is provided, the results did not quite match our initial expectations. 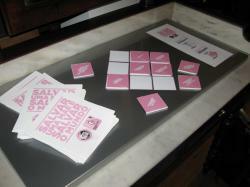 Once you decide to produce a sheet/leaflet, you need to consider a stand for it. Our choice was a totem display stand, where the design of the top corresponded to the icon representing MDG 2. Once your support materials are printed and ready to use, you need to decide on the best way to set up the installation at the right location (previously discussed and approved). Do not forget to record through photographs the process of setting the installation up, and make sure everything is in order and that the space and the topic complement each other. 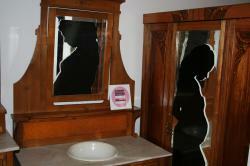 Initially, the pregnant women silhouettes were glued to the mirrors in the furniture storage room. Unfortunately, the glue was not strong enough to hold the silhouettes in place for very many days. So, the solution was to hang them directly on the mirrors. In addition, we provided a reading sheet to convey more information on the traditional way that local women give birth and on the child and maternal mortality rates. The totem stand holding the respective sheets/leaflets is located nearby. For evaluation purposes, two bottles have been placed nearby. One bottle is empty and has written on its label: "Place your vote"; the other contains pebbles that visitors can remove and place in the first bottle if they have appreciated the installation. The project seeks to achieve the highest possible number of visitors, for which purpose a communication plan has been produced for each of the ten installations. This identifies key institutions, communication channels and the type of message to be transmitted. With a high reach in Portugal, Facebook is a powerful means of communication. Drawing on previous research done for the sheet/leaflet made it easy to create an “effective post” in advance to feed the project’s Facebook page. It is necessary to understand the impact that the installation has on the media agenda. Nevertheless, you should still issue press releases, particularly to the local media. To increase publicity around the installation, a flashmail was produced, which includes the poster image, a brief message on the specific topic, and a summary of the project and its sponsors. Installations should be publicised systematically and, if possible, by all the project’s stakeholders and partners through their own (internal) communication platforms. In this way, the installation was widely publicised through the project’s official Facebook page, IMVF's website and the networks of our partners. It is not always possible to be present at the inauguration. For this installation, we decided to organize a virtual inauguration, meaning that the project’s Facebook page was put to good use. A photo album presented the various elements that make up the installation. The inauguration took place on Mother’s Day. The installation is located in the perfect setting within the museum: the furniture storage room, a gallery displaying the domestic environment of local rural people over the last 100 years. The installation builds on the existing exhibits portraying the traditional method of giving birth at home, a procedure that often endangered mother’s lives. The mirrors act as frames where silhouettes of pregnant women have been placed together with a short sentence for visitors to reflect on. As a result, the installation is very engaging (as it is visual rather than being accompanied by long academic texts) and it effectively encourages reflection and debate, which may contribute towards visitors changing their attitudes. The installation is in a section of the museum that may not always be open to the public, since it also acts as a storage room. However, visitors are usually free to access this room as part of the permanent exhibition. The room is quite full of furniture, which may make it difficult for visitors to move around. Therefore, the installation cannot be viewed by large groups of people at the same time, which hampers group reflection. Even if the site appears to be the most suitable one available, you should reflect carefully on the choice. Indeed, the difficulties over accessing and moving around the room would normally exclude the choice of this room. However, in places like local museums where space is limited, one needs to make tough choices. There was no other location where the installation could combine local and global aspects so perfectly and effectively. We believe we have achieved our goals by raising awareness among visitors. Nonetheless, the installation would be more effective if the room had more space. If we had more space, it would be possible to add another game which would encourage greater reflection and discussion among visitors to this installation. Visitors gave positive feedback on: the connection between the topic and the installation’s location; the simplicity of the idea and its execution; and the way that the game allows you to see and understand the links between maternal health, education, access to health, and so on. Visitors gave negative feedback on the lack of space. The installation is in a dark room with little light and cluttered with furniture, making it difficult for visitors to move around and to read the installation’s information.